Asteroids missing us or hitting us ...., when ...? There are some beautiful sites on the net like the NEAR site of Nasa/JPL showing the orbits of the known asteroids . Some of them allow the generate the ephemerides , which can be used in GravSim . Looking at the distribution of distances ( "miss" distance) the cumulative distribution looks linear ... No known asteroid of this 314 will hit the earth , however the line can be extrapolated to the radius of the earth , showing that one of these ( yet to be discovered ) can hit the earth in a time span of 2 years . I created an excel file for these ...but am not able to post it . Wondeful data list to play with TY. Could you put a duplicate post of it in the News section. I feel that it's a good place for it. Apophis ( 2004MN4) will pass close to Earth in 2029 April 13. Herunder a simulation using the Picard (17 bodies , starting on 01/02/07 ) . Initial values were taken by Tony from the JPL ephemerides . 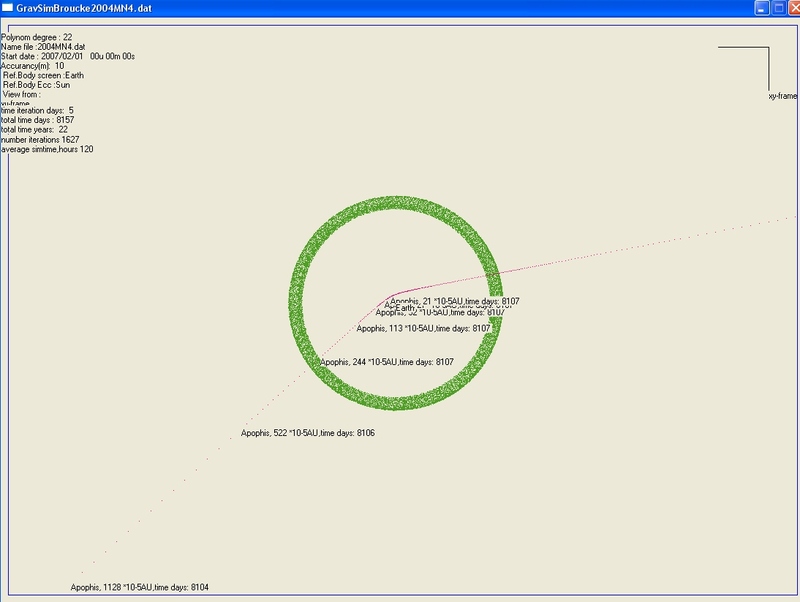 Fig shows that Apophis will miss us on 01/02/07 +8107 days = 13/04/2009 on 21*10-5 Au's ie about 30.000 km . The dotted points become a line in the Earth neighbourhood as the program slows down . 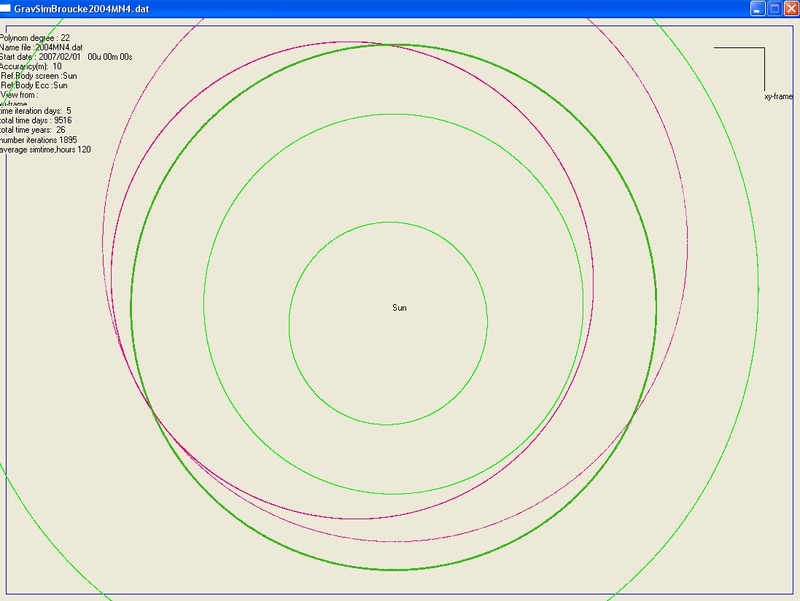 The green orbit is the orbit of the moon . Will the Asteroid hit us later ? It seems not , as the orbit , due to the close encounter is heavily altered . Apohis' orbit , seen from above , centered to sun . The inner red circle represents the orbit before 2029 . After the close encounter Apohis gains speed and is directed almost to the orbit of Mars . 2036 is the next year Apophis has a chance to hit the Earth. This will only happen if it passes through the keyhole during its 2029 pass. The keyhole is very close to its projected 2029 trajectory, but it is believed with high certainty that it will miss the keyhole. I split this thread from the other thread, but it did not work quite right. Some posts that belong is this thread got left behind, and posts that shouldn't have been moved got moved. One interesting vieuw of the Apophis asteroid 2004MN4 is the vieuw in a rotating frame aroud earth . Simulation hereunder starts in 2007 and was run for 32 years from now , taking a screenshot every year. The asteroid passes 2 times "close" before it really comes close on april 13th 2029 . The orbit is heavily disturbed afterwards as can be seen . I took a few more screenshots around the time of closest approach . A consequence of passing closer to Earth than our communication satellites. That just means that before the encounter it had a smaller semi-major axis than Earth, giving it a faster period. After the encounter it has a larger semi-major axis than Earth, giving it a slower period. I forget what the limit is, but appearantly you have not exceeded it. If you ever make a gif that is too large, you can e-mail it to me and I'll up it for you. well , the kB limit is not the problem ( some of those gifs are as small as 100k) , but the screensize. I always run the sim at full screen width and then adapt the anGif to scale it down . Perhaps I should scale it down further in order to fit on this screen.